Say what you will about Final Fantasy, but this is one franchise that has never been afraid to make drastic changes. After years in development, Final Fantasy XIII is finally here but not everybody is going to like the new direction for this venerable series. Could it be that Square Enix changed too many ingredients and will now leave a bad taste in your mouth? Thankfully my experience with this lengthy adventure game tasted good, but I wouldn't be surprised if this was one game a lot of long-time fans want to spit out. 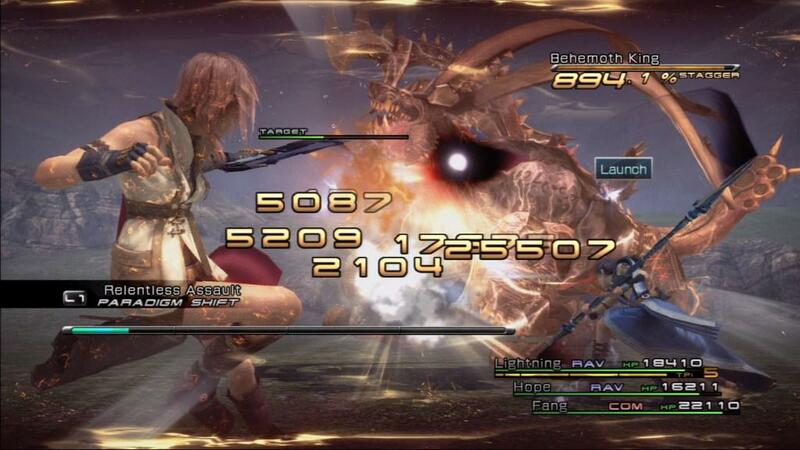 Final Fantasy XIII takes no time getting started. We jump into the action right away, with a daring escape from a confining train. We're quickly introduced to Lightning and Sahz, a couple of mysterious characters that seem to be on some sort of mission. Across town is a group of ragtag freedom fighters looking to bust into a huge facility and battle some evil-doers. Their leader is Snow and he too seems to be on some sort of mission. There's this girl he's looking for, somebody that has been taken from him. It turns out that everybody is after the same thing, a girl named Serah that is unwittingly going to change their lives forever. We're told from the start that there is a Borg-like race of people who will kidnap you and leave their mark on you. These people are given a tattoo and a focus, a task they are given that will ultimately be the final thing they do in their life. If you do not complete this special task then you will be magically transformed into a blood-thirsty monster. If you do manage to complete your task, then will be rewarded for your hard work by turning into a lifeless crystal statue. For obviously reasons anybody who gets one of these tattoos fears for their life, because no matter which option you choose it isn't going to end well for you. 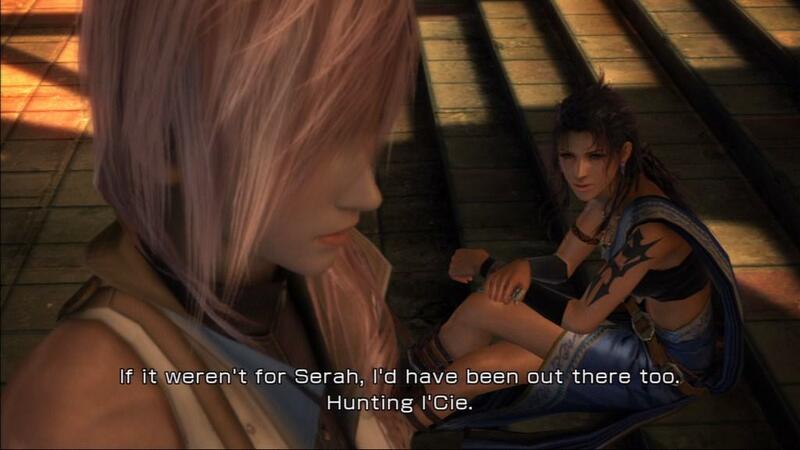 Serah has this mark, and her boyfriend (Snow) and family (sister Lightning) are trying to save her. 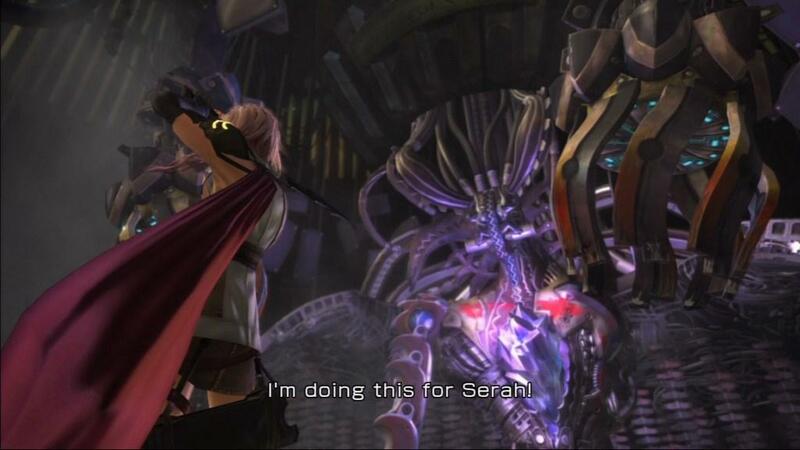 Unfortunately, Serah isn't looking to be saved. She's here to convey an important message before she is magically transformed into a crystal statue. Her message is to save the world or die trying. No pressure. Before they know it, these strangers (which also includes an annoying teenage girl named Vanille and a shy boy named Hope) are all given marks and a focus. At first glance their focus suggests that they will be the people that bring on the destructive forces and end the world as they know it. Could they be the evil they are trying to defeat? Are they going to be responsible for millions of people dying? One thing is for certain, this is one group that is not going to wait around to find out. Much of the game's first half is spent bouncing between multiple people in completely different areas of the world. While Final Fantasy games have dabbled with this sort of storytelling before (Final Fantasy VIII managed to incorporate this narrative with great success), this takes it to a completely different level. If it comes down to face time, you would be hard pressed to tell me who the main star is. Eventually the game settles down and it becomes the "Lightning Show," but Final Fantasy XIII always feels like an ensemble piece. 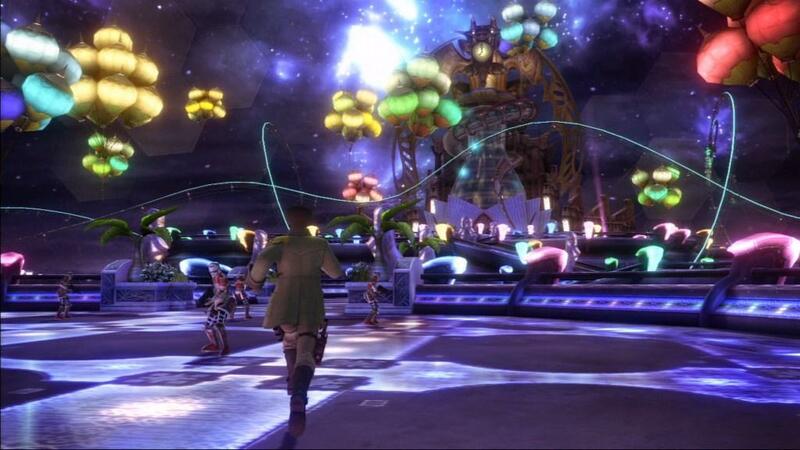 The game's narrative is far from the only change made in Final Fantasy XIII. For the first ten hours I was completely baffled by many of the changes made to this long-awaited sequel. Things that you have come to expect from every Final Fantasy game is nowhere to be found. Gone are the wide-open dungeons ripe for exploration, in their place are a series of narrow corridors. Gone are the towns where you gather information and visit the local Inn, in their place is a save point that doubles for a shop. You no longer have to worry about what kind of armor you wear, since there isn't any. At first glance it's all completely different, sometimes in confusing ways.As I spent more time getting used to these weird changes, I realized that what Square Enix is doing is streamlining the process. They've made a list of all of the essential elements of Final Fantasy and intend on checking them off, but at the same time they are making this game accessible to new and old gamers alike. While it might be jarring to no longer go to the local Inn, there's really no reason to now that you regain your health immediately after a fight. In fact, the computer store you shop at is way more convenient than walking all the way back to some lousy town. It's the difference between going to the store and online shopping. After awhile I found that I didn't even mind the narrow corridors. The game is telling a linear story, which is no different from any of the past games. The big difference is here is that the game feels linear. Final Fantasy XII gave off the impression that you really could go anywhere and do anything, but that's only because the areas you explored were so large in scale. This is not that kind of game. This game is focused on telling you a specific story, and in order to do that it's going to take you in a straight path. But don't be afraid of the path. Oh sure, you don't get to explore every nook and cranny of some dungeon, but there's still loot to pick up and places to see. 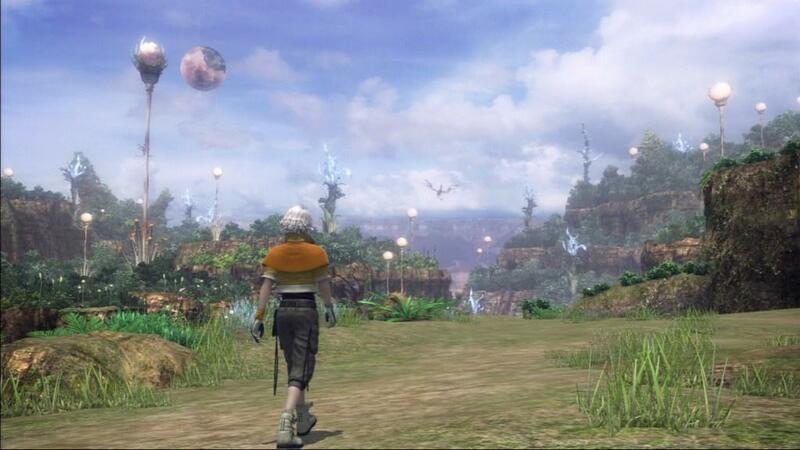 What's more, the more linear path has allowed Square Enix to show you more of this world than you would otherwise see. About half way through it struck me that this game is mimicking the level layouts of a game like Call of Duty, only instead of being a first-person shooter; Final Fantasy XIII is a game about killing fighting monsters. It's worth mentioning that while 90% of this game is set-up in a linear fashion, there will come a time in your adventure when all of a sudden you have the traditional wide-open areas full of encounters. At first I thought it was a mirage; perhaps I had been playing the game a little too long that night and I was hallucinating. But no, there really is a time when the game opens up and allows you to go on a series of side quests. It's at this time that the game started to feel more like Final Fantasy X and XII, two very different Final Fantasy sequels. But just as quickly as it came, it goes away. Before long you're back on the linear path to (hopefully) save the world. You may never warm up to the closed in environments; I can certainly understand some people being turned off by this design decision. However, if you let that get to you then you'll never discover the game's best asset - the brand new combat system. Although it takes the game several hours to fully explain how to play the game (including a couple hours where you aren't even gaining experience points), Final Fantasy XIII has a unique feel that I fell madly in love with. Even if you hate the characters and the linear story, I still say the game is worth playing simply for the combat. 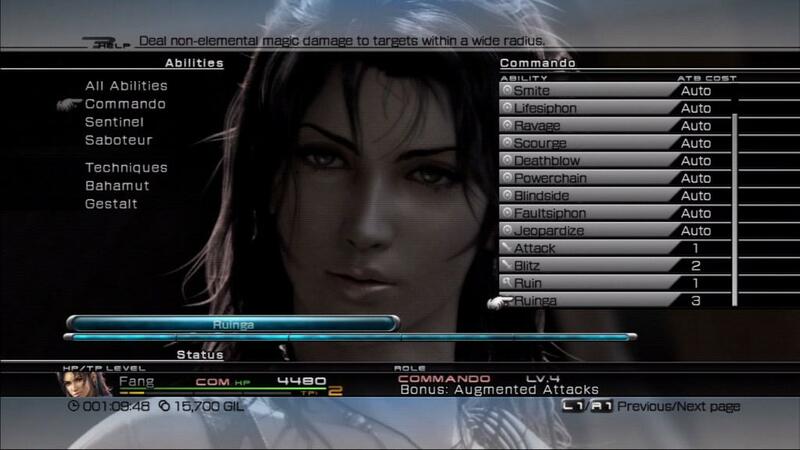 In Final Fantasy XIII you control only one character, whoever the party leader is at the time. This means that you will usually have one or two computer-controlled characters by your side at all times. While you aren't in direct control of their actions, you are in charge of controlling what kind of role they are playing. A character's role is sort of like a job, only in this game each character has three different roles that come with completely different abilities. For example, a character's role may be as a Medic, which means that they would have a lot of white magic spells, such as cure magic and the ability to resurrect a fallen teammate. There are six roles in all, each of them with their special pros and cons. There's the Ravager role, which allows a character to quickly stagger an opponent with weak attacks, leaving the enemy dazed and unable to attack for a short period of time. Then there's the Commando, which is good when you have an enemy staggered and need to bring in the heavy attacks. You can change these roles at any time, it takes no more than a second and you're controlling a character with a completely different set of moves.Because you can change these roles on the fly, it's important to use the roles together to get the most out of your attacks. When you're low on health it might be worth bringing in a couple of medic-class characters, while another character plays the Sentinel role (a defensive job where you take the brunt of the damage, leaving everybody else to heal and charge). Or maybe you would want to bring in a Synergist or Saboteur, two roles that involve the characters casting defensive and offensive magic to swing the fight in your favor. Needless to say, because this is so new it's a little hard to explain in just a few paragraphs. The game seems to admit that it's complicated, as they walk you through each step until you grasp the nuances. Chances are you won't fully understand why this combat is so much fun until you play the game, and even then it may take several hours before you really grasp its true depth. When you've mastered these roles it's hard to put down the control, there's an addictive quality to the fighting. The combat is insanely fast, maybe even too fast for some people (you can slow it down in the options, in case you're one of those people). You may not be as hands on as you were before, but you're not going to complain when you're swapping out classes and dealing with your own turns. Because so much of the story is spent away from the other characters, I was worried that I wouldn't be able to properly level up my characters. Thankfully Square Enix has managed to incorporate a leveling up system that is fair to everybody. No matter who you have in your party, everybody gets the experience points. That means that even if you don't use one of the characters until late in the game, that character will still have all of the experience points won over the course of the adventure. This allows you to easily swap in characters you normally don't use late in to the game without ever feeling like they are not going to be up for the fight. Sense we're on the subject; it's worth mentioning that leveling up has been completely revamped for this installment. 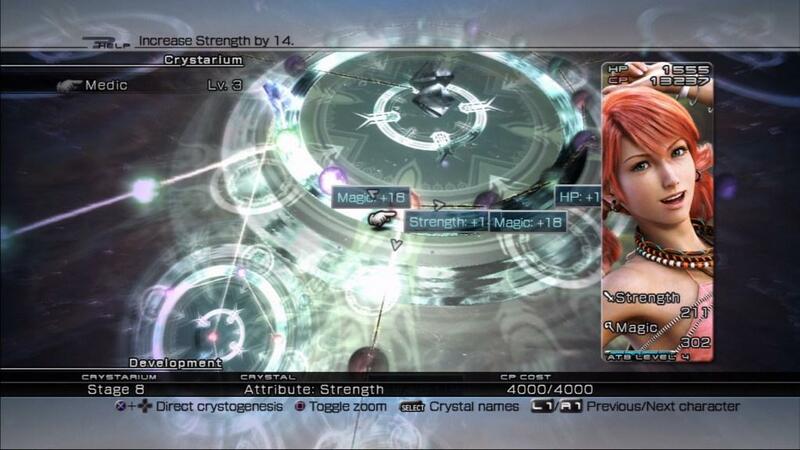 Instead of getting into battles and earning experience points, in Final Fantasy XIII you earn Crystarium points that can be used to upgrade very specific parts of your character. Each character has a few branches to develop their attributes, allowing you to choose whether you want to focus on giving each character additional hit points, magic points or strength points. In this mode you also get to purchase additional attacks, including magic, combos and the rest of the things you usually see in Final Fantasy games. It's a little complicated at first, but I like that you have some control over the improvements of your character. While I can get behind most of the changes made to the game, I'm a little frustrated by Final Fantasy XIII's erratic pacing. Early on the game pushes you constantly forward, giving you plenty of enemies to kill (or avoid) along the way. It's easy to breeze through the first half of the game without dying once. In fact, I don't believe I let my party leader die even once before I hit the 20 hour mark. But then, out of absolutely nowhere, the game shifts gears and becomes insanely difficult. Suddenly the game is throwing huge boss battles one after another. Even some of the regular enemies turn out to be incredibly tough fights that are no less grueling than a regular boss battle. And it's not just the difficulty the ramps up, it's also the confusing storyline. I won't say the story is bad, but it's clear that the narrative jumps off track towards the end. It's not that there are a ton of twists and turns, but rather that the story just begins to make less and less sense. By the end of the game I honestly had no idea what was going on and why I was fighting some of these bosses. It feels like the writers had a great set-up that they didn't know how to end. It ultimately ends in a whimper, leaving me feeling a little cold when the final credits hit the screen.Despite these imperfections and questionable design decisions, I really did have a great time with Final Fantasy XIII. While part of it is certainly the addictive combat gameplay, it also has a lot to do with the stunning presentation. Final Fantasy has always looked good, so I'm not breaking any news when I say that the visuals in part 13 are jaw-dropping good. From the moment you see the crystalized ocean waves to the end cinema, every inch of this game looks about as good as you can imagine. The character models look as good in-game as they do in the cinemas, full of details that sparkle on a high definition television. The combat is also spectacular, pulling you in with fast-paced action and cinematic camera sweeps. And best of all, the game is constantly throwing new environments at you, something that certainly pushed me to see the very end of this lengthy quest. The music is also good, but do you expect anything less from a Final Fantasy game? There are a lot of familiar sounds and musical themes that fill the air. It's not my favorite Final Fantasy score, but even the worst Final Fantasy soundtrack blows most other games away. I also enjoyed most of the voice acting, though some of the characters are written in a way that feels like it's intended to drive me up the wall. Was it really necessary to bring a 16 year old girl with ADHD along for the ride? She's just a little too hyper and annoying for my tastes, especially since she seems to show up in a disproportionate amount of cinemas. Still, she's nowhere near as annoying as the baby character in Square Enix's other recent PlayStation 3 role-playing game, Star Ocean: The Last Hope - International. 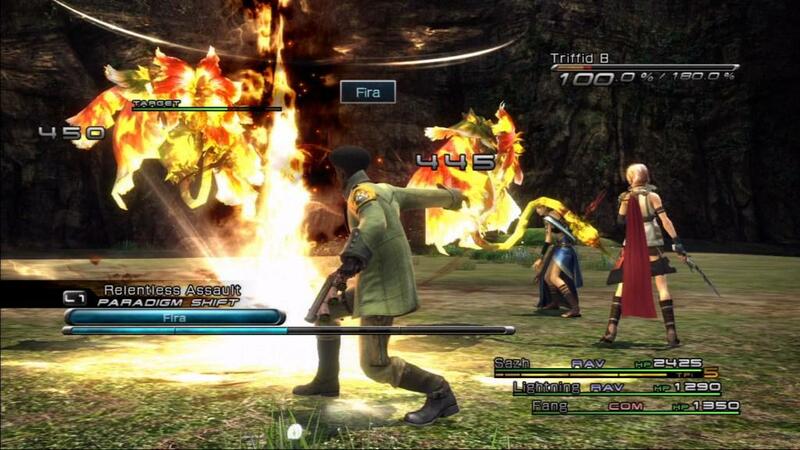 There's no question that Final Fantasy XIII attempts something brand new. It streamlines the experience in such a way that it may actually turn off long-time fans of the series. I found the combat (and the graphics, of course) to be compelling enough to keep me going for the full adventure. If you're looking for a more traditional Final Fantasy experience, then perhaps you should check out Star Ocean. There are plenty of traditional RPGs that do exactly what you expect them to do, so I'm willing to give Square Enix some room to experiment. Final Fantasy XIII is neither the best nor the worst of the series; it's simply a good adventure game that is worth 40 hours of your life. 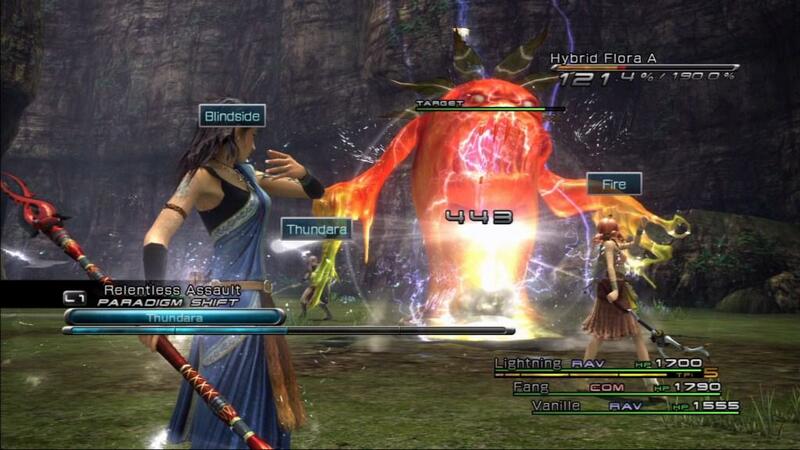 There's not much middle ground for Final Fantasy XIII, either you'll appreciate what it's trying to do or you won't. Thankfully I had a great time with these characters and enjoyed most of the changes made to the game. However, there were plenty of questionable gameplay decisions that continued to baffle me long after I beat the game. 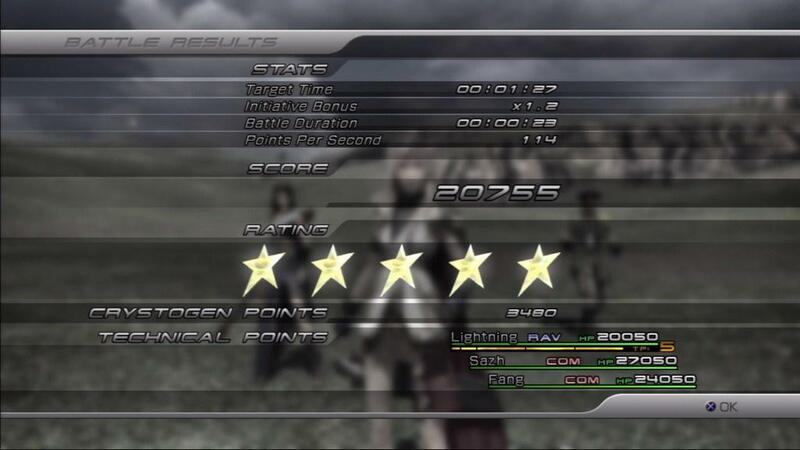 Even though my positive score comes with some caveats, I still say Final Fantasy XIII is an incredible adventure that is (mostly) worth your time!